Health Science Center ribbon cutting ceremony. In less than a month, students in St. Scholastica's graduate Physical Therapy and Occupational Therapy programs will start taking classes in the College's newest building. The 45,000-square-foot Health Science Center, located in the BlueStone development at 940 Woodland Ave., will open for summer classes in late July. 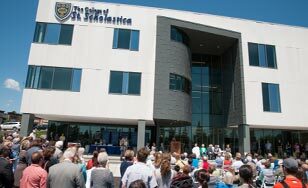 The College held a celebration in honor of its newest facility in a ribbon-cutting ceremony on June 23. More than 250 people attended the event, including College faculty, staff and students; project partners; and community members. The ceremony also marked one of the final official events of outgoing President Larry Goodwin, whose leadership helped to make the Health Science Center a reality. "On behalf of the College's Board of Trustees, staff, faculty and students, thank you, Dr. Goodwin, for your vision and your tenacity. They made this facility possible," said Mary Ives, chair of the Board of Trustees. Goodwin cut the ribbon for the new building after a brief ceremony, which featured a thank-you from PT student Caitlin Vaughan, comments from Laura Sieger with key project partner maurices, which sponsored the maurices Community Clinic; and a blessing by Bishop Paul Sirba and St. Scholastica Monastery Prioress Beverly Raway. Goodwin thanked faculty, project partners, and supporters. "Most of all, I am excited for our students, who will make this wonderful facility their own," Goodwin said. "They will learn here, and launch careers of service here that will benefit us all. I hope that our faculty and students find this an effective setting for learning for many decades to come." An Activities for Daily Living suite, including a kitchenette, bedroom, washer/dryer and bathroom, that will allow students to work with patients on helping them to regain everyday living skills after an illness or injury. The building was designed by HGA Architecture, Engineering and Planning of Minneapolis. The contractor is McGough Construction Co. of St. Paul. Design highlights include a student lounge with a wall of windows featuring breathtaking views of Lake Superior; a main staircase featuring a wooden walnut accent wall and a bluestone rock garden beneath, and two laptop/study areas on the second and third floors that overlook the main entrance and also offer lake views. The building will also be home to the College's new Physician Assistant program starting in Fall 2017, pending accreditation. The local media was in full attendance to cover the Health Science Center ribbon cutting. News stories were produced by WDIO-TV Channel 10; KBJR-TV Channel 6; the Duluth News Tribune; and Business North.